If you are interested in doing serious restoration work on your Triumph, sooner or later you will feel the need to have your own blast cabinet. This article is a summary of the information I presented at our last regular meeting. This article briefly discusses some considerations related to the actual design of the blast cabinet. The accompanying article by Louis Boucher gives construction details for the cabinet he recently made. I cover five main topics in my talk: air supply and conditioning; types of blasting equipment; types of blasting guns; blasting media; and design considerations. Air for the blast cabinet is delivered from a compressor. The choice of compressor is an important consideration, and the choice you make should be determined by the amount of usage you plan to make of the compressor, your budget, and the need to have a compressor that is portable. Compressors are rated according to their ability to deliver air in SCFM (standard cubic feet per minute, and ratings are usually given at 40 and 90 pounds per cubic inch). As with most things, more is better, but costs more. I have compared several popular and locally available compressors to determine their efficiency and cost. There are two types of compressors — single stage and two stage. As well, there are compressors with several cylinders. Single stage compressors pump air directly into the holding tank; whereas, two stage models pump air from one pump to another before delivering the air to the holding tank. Single stage, two cylinder models are most common and sufficient for most of our hobby needs. Figure 1 shows the relative efficiencies of several locally available models as well as their costs and air-delivery specifications. For blasting work at about 60 psi, a compressor that delivers about 6 SCFM will be slow, but cost about $450, one that delivers about 12 SCFM would be fairly good and cost about $650, and one that delivers 18 SCFM would be good and would cost about $1000. After that, you get into industrial grade equipment and cost can easily exceed $3000. When I was comparing the various compressors I calculated their relative efficiencies and decided to choose the Eagle brand. Your requirements and budget may lead you to make another choice. A couple of other points of note. The horsepower ratings that are given in all the compressors are at best a guide, but the advertised ratings are generally higher than the actual electrical horsepower that can be generated by the motor. If you decide on a 230 V unit, make sure the electrical wire and breaker are adequately sized. A 5 HP model will require a 30 Amp breaker and number 10 wire (the same as a dryer). As well, compressors get hot and several of the units are designed to run for only about 10 minutes at a time. If you are blasting, you will find that the compressor will have to run constantly. The pump itself can reach temperatures of 70 C and the tank 50 C. As the temperature rises, the efficiency drops, so some people use an external air intake to obtain cooler air to feed the compressor. You may want to consider running copper pipes to distribute the compressed air throughout your shop. The pipe should be large enough so that it does not limit air flow. A 0.75 inch copper pipe seems to work well. You should also limit the number of 90 degree bends in your pipes as they greatly limit air flow. Instead use 22.5 or 45 degree elbows or make your corners out of hoses that make gradual turns. No matter which compressor you decide on, and how you choose to distribute your air, you must take steps to ensure that the air pressure is regulated and that the air is dry and clean. Two inexpensive pieces ($20–30) are required between your compressor and the blast cabinet. The first is a filter that removes water from the atmosphere, oil from the compressor, and dirt that may accumulate in the pipes and hoses. Most common are particulate filters that work on the basis of centrifugal force and a filter media of about 40 microns. These are readily available and are adequate for use with a blast cabinet. A regulator is used to adjust (reduce) the air pressure delivered to the blast cabinet. A pressure of about 60 psi is about right. If the pressure is too high you can distort the metal you are blasting and breakdown the blast media. It is best to buy filters and regulators with 3/8 inch (rather than 1/4 inch) inlets and outlets as these larger units do not result in such large pressure drops. There are basically two common types of blasting equipment. Direct pressure blasting uses air pressure to directly push the blast media; whereas, the siphon method uses air pressure to create a vacuum that pulls the media. These two basic configurations are shown in Figure 2. The direct pressure system is about four times more efficient, but costs about $400, the siphon system costs about $40, but requires a larger compressor to work well. Cabinet blasters use the siphon system to draw the media from a self-contained reservoir. 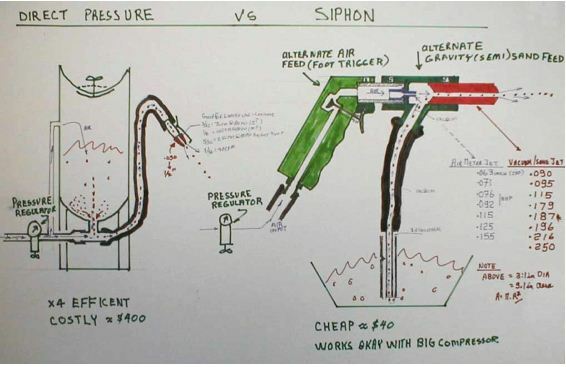 Figure 2: Basic Design of Pressure and Siphon Blasters. The critical component of this system is the gun. The air metering jet determines the flow of air through the gun and is sized according to the compressor output. For a 2 HP compressor this jet should be about 1/16 inch. For a 5 HP compressor it can be larger (about 3/32 inch). The size of the sand jet, in combination with the size of the air jet, controls the vacuum that is created to draw the sand up the hose. These come in various sizes, but for a 5 HP compressor a sand jet about 3/16 inches seems to work well (in combination with the 3/32 inch air jet). One other consideration for guns is the trigger mechanism. Most guns come with a one-finger trigger, which can be tiring to use. A better alternative is a gun with a full-length trigger that is controlled with all four fingers. I have installed a foot-activated electrical air valve to stop and start the flow of air to the gun and now have no worries about trigger-fatigue. Most people think of sandblasting when they think about blasting. However, a range of media types are available, and without proper breathing equipment you should not use silica-based (sand) products because they are carcinogenic. Many factors determine the characteristics of blast media, but the most important for blast cabinets are: hardness; shape; size; specific gravity; and cost. Hardness is indicated by the Mohs number of the media. This hardness scale was developed by F. Mohs (1733–1839), a German Mineralogist. The scale ranges in increasing hardness through ten steps. If you look up Mohs Scale in a dictionary you can usually find a table showing his hardness scale. The softest material (talc) in the scale has a hardness of 1. The hardest (diamond) has a hardness of 10. Figure 3 shows the characteristics of some common blasting media. There are many other media available, but recycled glass and glass bead are commonly used and give good results. Walnut shells and other softer media can be used to polish soft metals such as aluminum, and harder media such as aluminum oxide are better reserved for heavily rusted pieces such as wheel rims and suspension parts. Figure 3: Characteristics of Common Blast Media. Generally, media with a hardness of 1–4 are used for cleaning, polishing, and de-burring, media in the 4–6 range are used for more aggressive cleaning, and those in the range 6–10 are used for scale removal and deep cleaning. Shape also influences the use characteristics of the media. The more angular the particle of media, the more aggressive it is. Three descriptions are commonly used: block (for cubic and rectangular particles), round (for semi-round and oval particles); and angular (for sharp, pointy particles). There are also differences in size, which are either given as the average size of the media (as measured in thousandths of an inch) or according to the size of a standard size sieve that the media will pass through. For example, media that would be classified as sieve 10, would be coarse and equivalent to about 0.0760 inch; whereas, a sieve 400 media would be fine (about 0.0015 inch). Specific gravity is a measure of the density of the material. Therefore, for a given mass, the higher the specific gravity, the smaller the particle. Since the force exerted by the particle is equal to its mass times the velocity it is moving at, this means that particles with higher specific gravity will exert more force at the same velocity. Cost is not prohibitive when you are choosing the blast media because it is recycled within the cabinet and can be used repeatedly. Media costs between $20 and $90 for a 50 lb bag and this amount can typically be used for many cycles (100–1000). As you design your own blast cabinet or buy a commercial one, here are some of the factors you should take into consideration: size, lighting, window, door size, grate, changing the media, dust control, and gloves. Size — make sure the cabinet is as large as you can accommodate in your shop. The size not only limits the physical size of the objects you can put in the cabinet, but the room you have to manoeuver the pieces once they are in there. Lighting — an excellent light source is critical to working well. The light should be external to the blast area and the light source should be well ventilated to dissipate heat. Window — generally, the window can be vertical if you are sitting at the blast cabinet, but should be sloped if you are standing. Door size — the door should both be large enough to allow easy removal of the grate for cleaning and to allow easy access to the cabinet for parts that are to be blasted. Again bigger is better. Grate — the grate should be solid so that it withstands heavy things being dropped on it, and it should have small enough openings to keep small objects from falling through. The cabinet I just built is made of 16 gauge perforated steel on an angle iron frame, and this seems to work very well. Changing media — it is important to have a drain of some kind to make changing media as easy as possible. When making your own cabinet a simple bottom drain made from plastic plumbing fixtures works well. It is useful to include a sieve at the bottom of the blast cabinet to keep large chunks of debris from plugging the gun. Dust control — a shop vacuum works well to collect dust from the cabinet. I have found that a standard shop vacuum operated with a cloth dust bag works well. The input in the cabinet is covered with a 0.025 inch screen to ensure that media is not drawn into the vacuum. Gloves — industrial rubber gloves are cheap (about $6 a pair) and can be fitted over 4.5 – 5 inch plastic PVC coupling pipe cut to 2 inches in length.